Lone Star Ranch Amenity Center in Frisco, Texas was recognized with the "2003 Summit Award for Excellence in Construction" from the Quoin Chapter of The Associated General Contractors of America. Telos Performance Center in Farmers Branch, Texas received the "2005 Nova 7" Award from Fitness Management magazine in the category of Best Innovation in Facility Design, Construction and Decoration. Built as a racquetball club in the early 1980s, the TELOS Performance Center had lost its appeal in the marketplace. 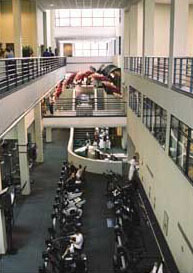 Since the name and concept of the facility is derived from Greek (telos: to accomplish one's mission or goal in life; the embodiment of the whole; completeness), the design team believed that the redesign should incorporate Greek and Roman themes. One major change, called the Coliseum, was originally a basketball court, and is now the cardio and weight equipment area. It features color-matched flooring and equipment frames and pads and free-standing mirrors and Greco/Roman finishes. Another redesigned area includes new yoga and Pilates studios. They feature a Zen rock garden, water fountain, and stone bridge at their entrances, which serve to separate this area from the bustling activity of the other areas. Each room is soundproof, with suspended wood flooring and natural bamboo ceilings. Local Boy Scouts provided the labor to lash and tie the bamboo in place as part of their service and skills requirements. The use of a warm color palette throughout and natural elements of stone, slate, cork, bamboo, wood, and light help create a sense of tranquility and relaxation that is uncommon in most facilities of this type.